Does the DM processor or Matrix DSP amp come with a microphone for it’s RTA function? 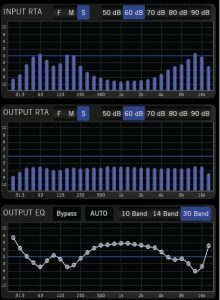 The DM processors and the D-4.800 do not have a built in microphone. The RTA within the DM smart App is within the software. It is analyzing both the inputs and outputs within the processor itself. This will enable the user to be able to see real time what their crossover and EQ adjustments are doing to their signal within the processor. This feature is especially helpful for an OEM integration install. Using the RTA, the user will be able to very quickly identify band passed outputs and to sum accordingly. Or, adjust for any OEM built in EQ curves. For example, the screenshot below shows the input RTA reading a substantial EQ bump on the high end and the low mids. The auto EQ function has been applied to create a relative flat frequency response shown on the output RTA. Below that shows the EQ curve that has been applied by the Auto-EQ to acheive the flat response. From here, the user can then use a separate RTA microphone to adjust the EQ for the acoustics of the vehicle.